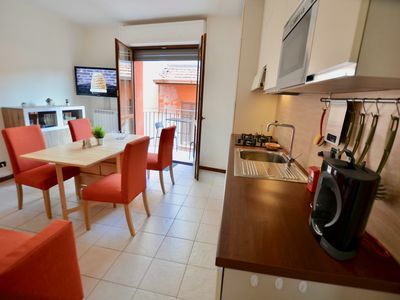 Apartment located in a quiet location on the complex Villaggio Lago di Como in the town San Siro, hamlet Acquaseria. The apartment has a living/dining room on the second floor and two bedrooms. If you order bed and bath linen, the beds will be made up. Perfect after your long journey. A fully equipped kitchen with gas hob, oven and large fridge. The dining/living room has a sofa bed for two persons. A bathroom with bath/shower, bidet and toilet. The total area of the apartment is 50m2 and suits 5 people. The apartment is fully furnished and comes with flatscreen TV and satellite channels. Free parking near the apartment upon availability and parking in the indoor garage upon request at additional charges.